Just over a year ago, our local community narrowly escaped the onslaught of a devastating bushfire that burnt over 2,850 hectares of bushland in the area. In my post shortly afterwards, I wrote my personal account of an event I have never experienced before, nor wish to again. So, what has changed 12 months on? The Big Prawn on the Pacific Highway has not been rebuilt, and, given its rather odd location, I wonder whether the site will ever be redeveloped. But the bushland is beautiful once again. The first new shoots emerged from the ashy ground just a couple of weeks after the fire, and a colourful array of green and gold has gradually spread through the trees and undergrowth. Yes, there are still reminders of flames in the charred tree trunks, but overall it has been a fascinating example of nature’s ability to regenerate in record time. 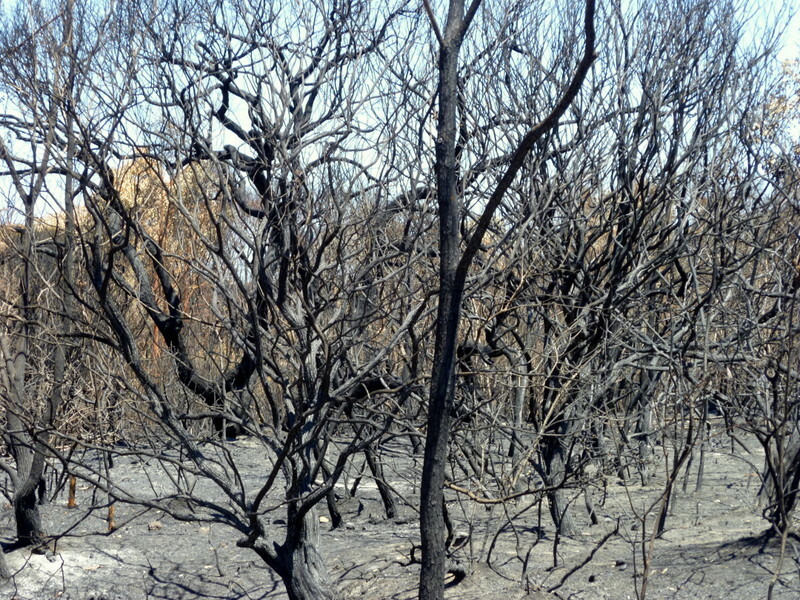 In fact, fire has very positive consequences for the Australian bush. 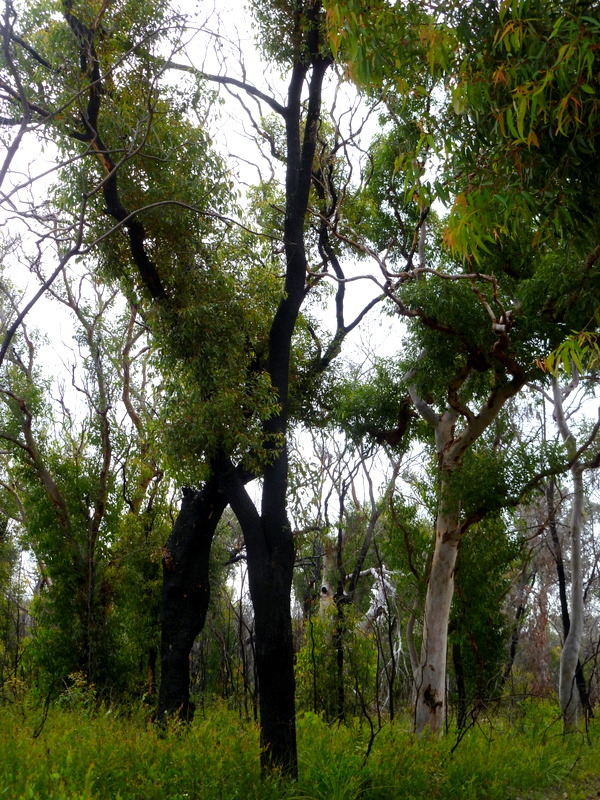 Eucalypts release their seeds in the intense heat of the flames; wattle seeds that have lain dormant in the soil burst open; and the bed of ash left behind is full of vital nutrients to allow strong new growth. And these are just a few examples. 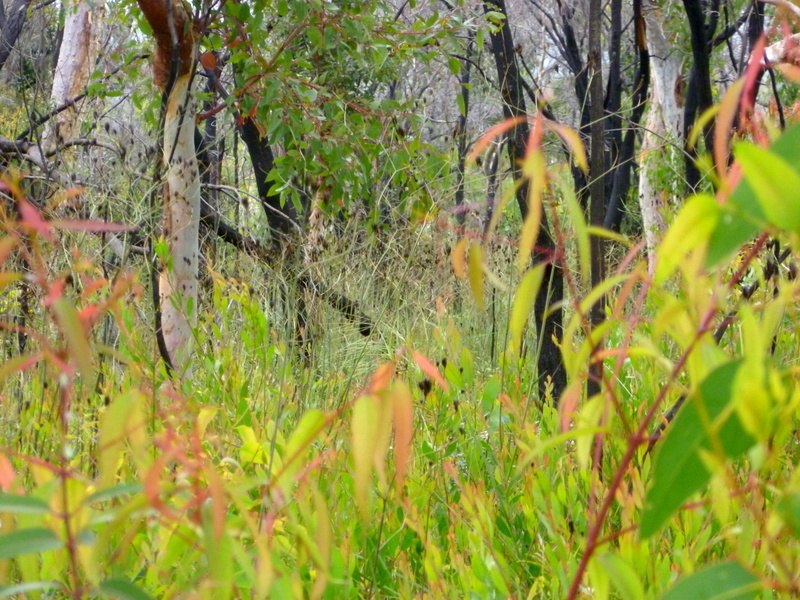 Little wonder then that the Aboriginals used fire as a tool to revitalise the bush environment. 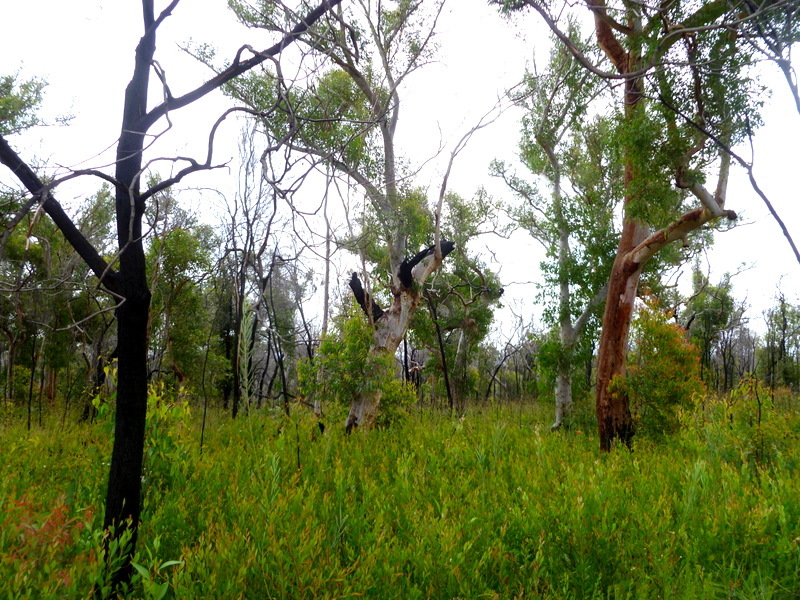 This Factsheet is a great source of information on the impact of fire on Australian bushland regeneration. 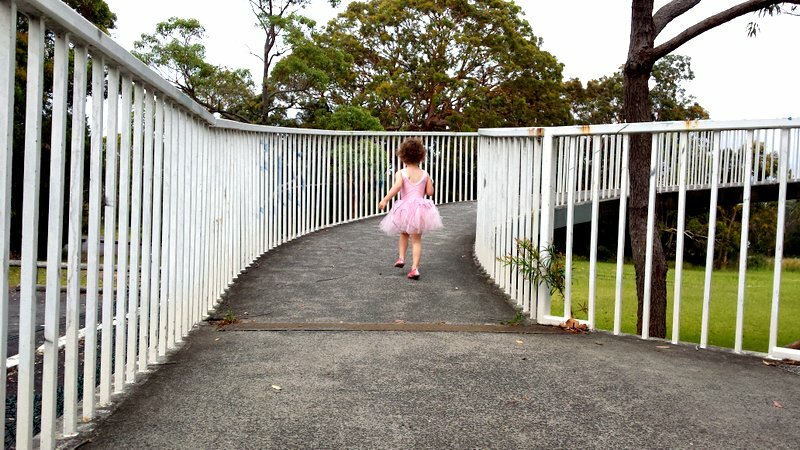 This entry was posted in Close to home, Life in Oz and tagged bushfire, eucalypts, giant praw, Pacific Highway, wattle on October 25, 2014 by Laura. I mentioned in my last post that I would be writing about our holiday in a series of instalments, rather than one giant missive. So here, people, is the first of these, starting at stop number one: Nambucca Heads. At 4.5 hours’ journey time from home, I did wonder whether Icklegen would last the distance (or me, for that matter). I needn’t have worried. She dropped off to sleep shortly after departure and snoozed for an impressively long time. We then had a decent snack and leg stretch at a playground en route, and the last part of the journey was made bearable by Daddy Ickle’s inspired idea to load some episodes of Peppa Pig onto his iPad for our backseat babe. 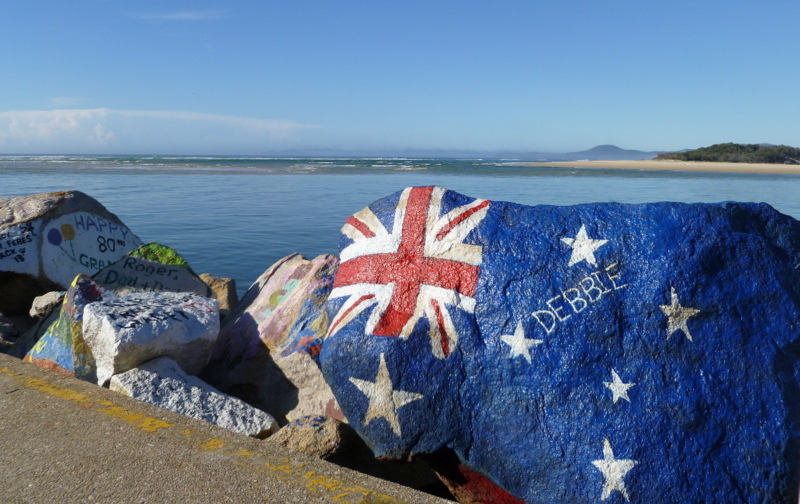 Nambucca Heads is located just off the Pacific Highway. In fact, it used to be on the main road north, but has been spared the traffic thanks to a bypass. What a relief that must have been for the locals and the tourists. Once a bustling port, it is now a quiet little place, or at least it is in the low season. 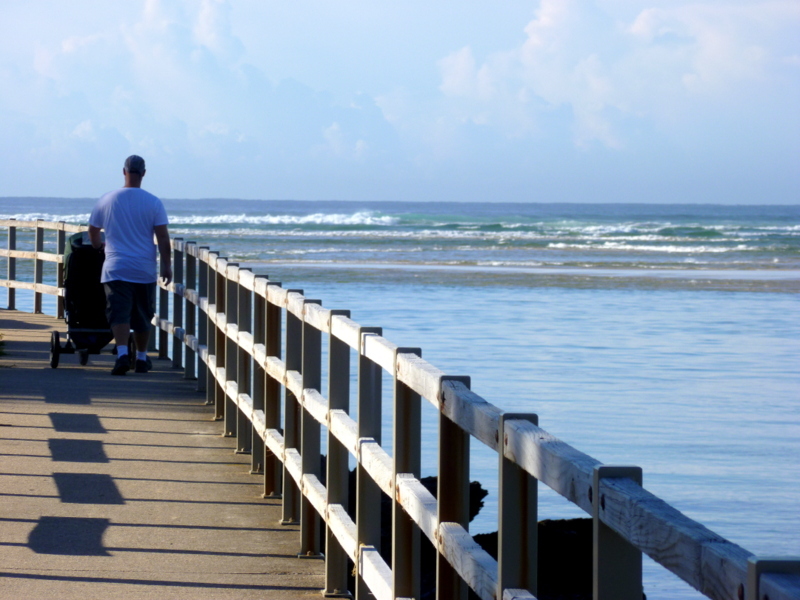 ‘Nambucca’ derives from an Aboriginal word meaning ‘entrance to the waters’, and it couldn’t be more appropriate. The view of the river estuary from the higher slopes is spectacular and two of the town’s must-see attractions are defined by their relationship with water. 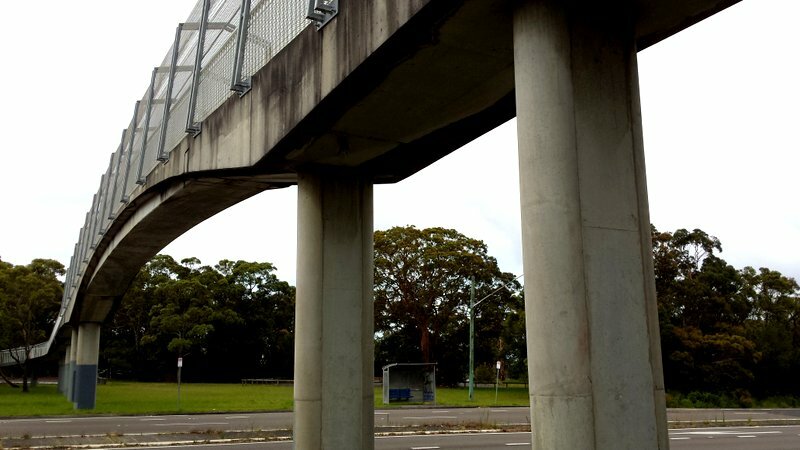 The first of these, the V-Wall, runs parallel to the Nambucca River as it enters the sea. 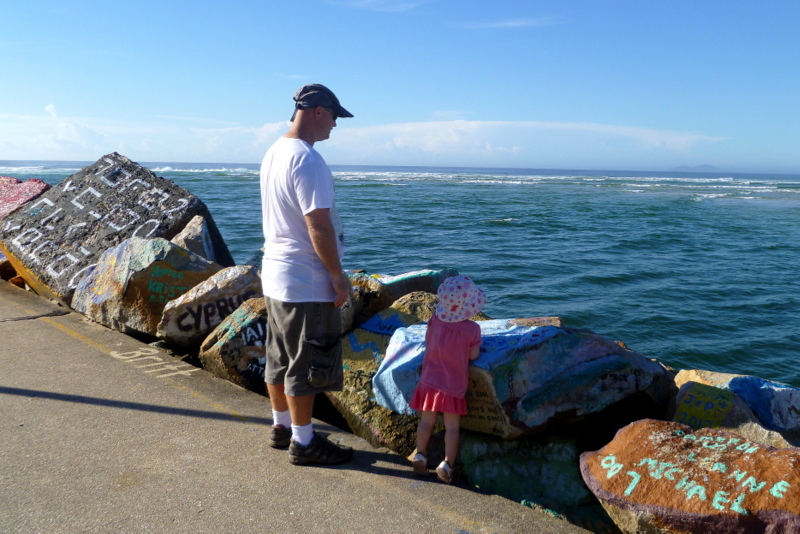 The wall is a graffiti artist’s dream: hundreds of boulders providing the perfect canvas for works of art and declarations of peace and love. Icklegen loved it. 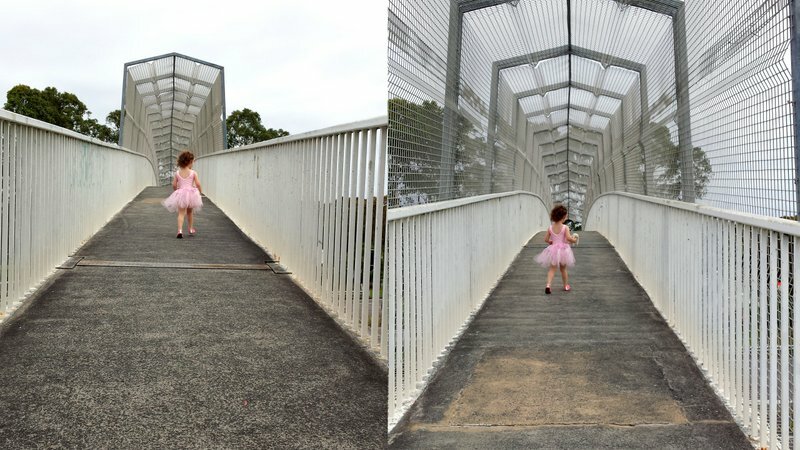 She danced along the concrete path and clambered on the rocks to have a closer look at the varying designs and bright colours. ‘The River’ mosaic outside the police station on Bowra Street is also well worth a look. Old china plates, tea cups, tiles and pottery have found new life as a plethora of water-dwelling creatures in this artwork depicting a river winding its way to the sea. Oh, and just down the high street from here, there’s a great little bakery Wild Terra where you’ll find beautiful bread loaves and French-style pastries for sale. Mmmm! We enjoyed strolling along the boardwalks along the water’s edge, too. 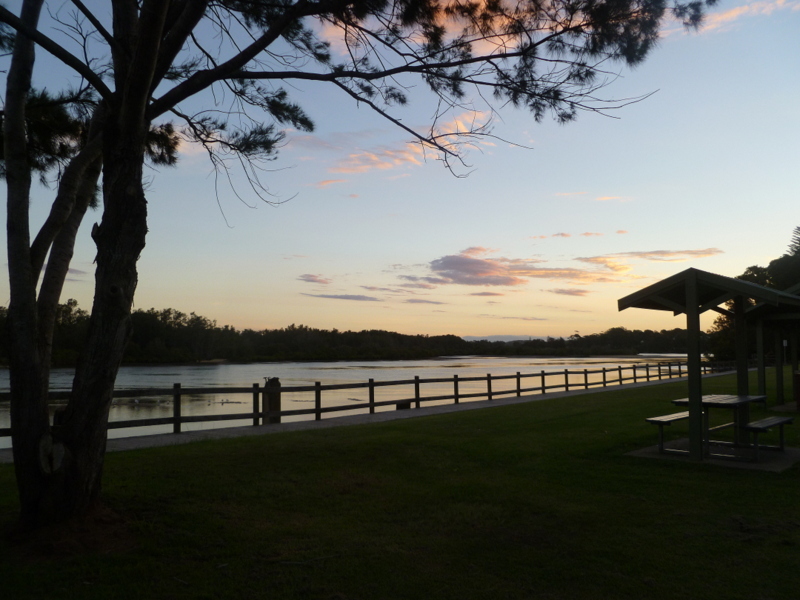 Much as we appreciated our 3-day stay, I’m not sure we would return to Nambucca for a holiday, although it’s a lovely and very convenient place to stop when you just can’t face any more travel time on the Pacific Highway. 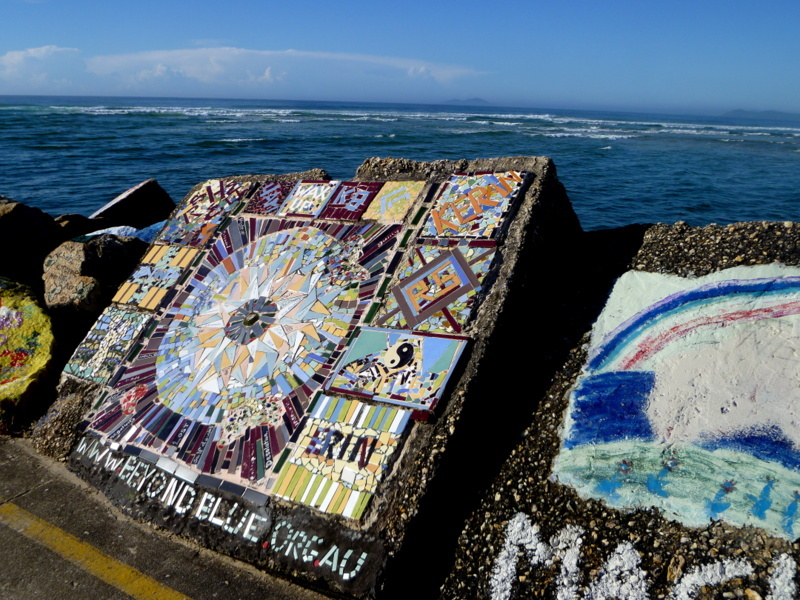 This entry was posted in Adventures, Further afield and tagged entrance to the waters, graffiti, nambucca heads, Pacific Highway, The River mosaic, V-Wall, WIld Terra bakery on April 17, 2014 by Laura.